Look, Prime Day 2018 hasn’t even officially started yet so it’s obviously impossible to say which deals will end up being the best bargains of Amazon’s big event. Now that Amazon’s first wave of deals has hit the site early though, we can say with near certainty that we’ve already found the most insane deal of Prime Day this year. 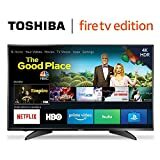 The Toshiba 50-inch 4K Ultra HD Smart LED TV with HDR – Fire TV Edition has been flying off of Amazon’s virtual store shelves at its normal price of $399.99. Seriously, think about how crazy it is that you can get a 50-inch television with a gorgeous screen, 4K resolution, and HDR support for just $400! Starting right now, however, you can get this awesome TV for just $289.99. Crazy! There is no doubt in our minds that this deal will sell out, but hopefully Amazon will keep offering it at this price with delayed shipping until the end of the day on Tuesday.